“BELIEVE IT OR NOT”, WHAT I SAW YESTERDAY IS FOREVER ETCHED INTO MY MIND! Yes­ter­day, the Balama Blaz­ers and I along with 2 of my best guards, left Balama at 5a.m. so that Hanna Gilman, RN stu­dent from Seat­tle, WA, could catch the after­noon plane to begin her jour­ney back to the USA. First on the agenda was beach time for the 3 girls, as this was a “biggy on Hanna’s bucket list”. In the mean-time, the 2 guards and I “hit the bank” to with­draw some dough so we could pick up sup­plies for the orphans. On our way back to the beach to fetch the girls, I pulled up to a stop sign fac­ing 4 lanes of traf­fic. This street is divided by a 6 foot con­crete median where cars can wait to safely pull into traf­fic on the far side. Since we drive on the left side of the road, we look RIGHT, LEFT, RIGHT before pulling out into traf­fic. Doing just that, I saw NO CARS in the imme­di­ate area. Pulling out into the median, ready to turn right into the proper lane, I sud­denly faced a brand new SUV right in front of me! All I saw were 2 white car doors directly in front of our car as I was turn­ing to move into that lane. Hit­ting the brakes, I saw no way to avoid a col­li­sion even though I was barely mov­ing. Sand on the tar road caused my car to slide a bit as I hit the brakes. What I saw next, will never cease to amaze me! My car slid to a stop, NEVER TOUCHING THE OTHER CAR because an unseen force actu­ally pushed the other car away from me!!! It reminded me of what hap­pens when you place the pos­i­tive ends of 2 mag­nets fac­ing each other and try to make them touch. One pushes the other out of the way, as like forces repel each other. That is exactly what I saw yes­ter­day when fac­ing this near collision. The 2 men with me in the car also wit­nessed all this, leav­ing us all speech­less with our mouths hang­ing open! The dri­ver of the SUV was yelling and curs­ing me because what­ever pushed him, caused him to believe we had HIT HIM. But when he saw no mark on his new car, he closed his mouth and drove off. None of us saw this car before I pulled out. All we can assume is that he came out of a small drive way just to the left of where I was cross­ing the street. Need­less to say, I was THRILLED that my ANGELS were on duty, because there is no other expla­na­tion for what hap­pened. It was AMAZING to see that heavy SUV actu­ally move AWAY from us, as my car came to a halt. That’s a men­tal video that will never be erased. GOD IN ACTION ON OUR BEHALF. I love HIM and all He does to keep us out of harm’s way. So what did we do next? Cel­e­brated LIFE by buy­ing a small tub of ice cream, and headed off to the beach to cel­e­brate Hanna’s last few min­utes with us. GRAB the moment, for that is all God gave us con­trol of. TIDBIT: The 2 guards had never had ice cream before and dearly loved it. It’s truly fun to watch peo­ple expe­ri­ence new foods for the first time. Hanna was a great asset to our team as she truly has the mak­ings of an RN, show­ing respon­si­bil­ity and faith­ful­ness in all she did while here. But God gave Hanna a VERY spe­cial love and “gift” for teach­ing chil­dren. So if you wanted to find Hanna, all you had to do was lis­ten for the sounds of chil­dren play­ing. The chil­dren truly adored her as she spent many hours play­ing bas­ket­ball, soc­cer, and AWANA games with them down at our Children’s Cen­ter. Hanna plans to spe­cial­ize in Pedi­atrics after grad­u­a­tion from RN school, and it is obvi­ous she will be a bless­ing to the chil­dren where ever God places her. I per­son­ally thank Hanna for shar­ing her gifts and tal­ents with our team and our chil­dren these last 3 months. I also send my THANKS to all her spon­sors who made her trip pos­si­ble. Hanna was a very valu­able part of con­trol­ling one of the corn chutes dur­ing food buy­ing, mak­ing it pos­si­ble to sack and stack 300+ sacks of corn that now fills our barn so that orphans will not go hungry. The 7 vil­lages in the area the Mango Tree Church, all came together on Fri­day to receive their first food gifts for 2014. 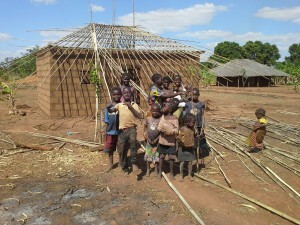 This year, there are 437 peo­ple in this group (277 orphans cared for my 160 wid­ows). Another child headed house­hold from the remote vil­lage of “Mag­aia” (Mah-guy-ah) have joined our fam­ily, as both par­ents of these 4 chil­dren passed away just 2 weeks ago from long term ill­nesses. They had moved here sev­eral years ago from another county north of Balama, so no other fam­ily lives nearby. Thank­fully, the old­est is a 16 year old girl and is able to care for them, so major assis­tance is being orga­nized to help them. Capena, our Orphan Man­ager, plans to visit them this week, tak­ing cloth­ing and other needed items. Neigh­bors in the vil­lage have vol­un­teered to guide and watch over them. YOUR LOVE GIFTS IN ACTION. BUNNY AND THE 3 BLAZERS BUSIER THAN 4 BEAVERS IN A SPRING FLOOD! Our inter­net is down com­pletely, so appre­ci­ate that we had to drive 60km (30 miles) in order to send this today. Wasn’t a huge sac­ri­fice since an ICE CREAM PARLOUR now opened in Mon­tepuez, so we all decided to “sac­ri­fice” and have lunch at this won­der­ful lit­tle out­door café where we can all use inter­net. After all, can’t let my friends down by not send­ing “THE BLOG”. Tee Hee! 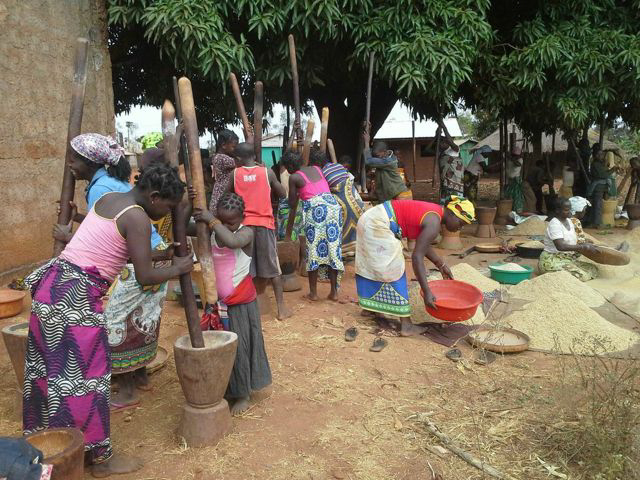 Balama women “piller” (dehull) dried rice in huge home-made pedestals for the 119 orphan chil­dren liv­ing at the Balama Mis­sion Station. SUNDAY AFTERNOON found me rush­ing Pedrito, one of our 4 year old twin boys, to the hos­pi­tal along with his fos­ter mother, Atija. After church, Pedrito sud­denly spiked a fever that peaked at 106F (41C), lost con­scious­ness as we drove him the short 2 miles to the hos­pi­tal, and went into con­vul­sions shortly after admit­ting him to the emer­gency room. We all “knew” it was cere­bral malaria just by look­ing at him, and prayed that Jesus would save him. Cere­bral malaria burns out your brain stem with a high fever ren­der­ing one uncon­scious, causes exces­sive brain swelling, kid­ney dam­age, fol­lowed by many con­vul­sions and finally death. Those that do sur­vive can expe­ri­ence brain dam­age. BUT JESUS ANSWERED in an awe­some way by hav­ing Pedrito WAKE UP in the mid­dle of the night! (Totally NOT a nor­mal response to 1 dose of malaria med­i­cine.) When we arrived the next morn­ing, he grabbed a sucker out of my hand, (totally nor­mal for Pedrito), and asked to go to the bath­room!!!! He had to stay to com­plete his 3 days of malaria treat­ments, but ended up spend­ing 5 days because he picked up dysen­tery while there. He hap­pily reunited with his 3 broth­ers at their home on Fri­day noon. JESUS saved Pedrito with a mir­a­cle heal­ing, no one could deny. Every­one at the hos­pi­tal was amazed at his “mir­a­cle recov­ery”, for all too often they “see the signs” and know the child will per­ish. Jesus used Pedrito’s ill­ness to show them that HE IS STILL THE ONLY ONE WHO CAN HEAL THOSE WHO APPEAR DOOMED TO PERISH! THANK YOU JESUS!!! Tues­day found Katie and I along with my Office Man­ager and right hand man, Capena, in Pemba to sub­mit her res­i­dency doc­u­ments at Immi­gra­tion. Best laid plans of mice and men didn’t work as they refused her police clear­ance because it didn’t have a “stamped” date and sig­na­ture on it (it was typed in). So new doc­u­ments were orga­nized in Texas with the proper stamp and should be here next week. Such are the “chal­lenges” of try­ing to get residency. A phone call Mon­day con­firmed that the 16 lb (8kg) diaphragm needed to repair the 7 ton truck was await­ing pick up at the air­port. Eric, now our “Bush Bear” on the ground in South Africa, had orga­nized the part and air shipped it. Nis­san in Pemba didn’t have it, and would have to order, tak­ing up to a month to get. Our hun­gry kids at the Ele­phant Vil­lage can’t wait that long, so “The Bear” saved the day! We asked an Aus­tralian friend, a mas­ter mechanic, to install the part. Arriv­ing home from Pemba at 3pm with me totally beat after the 11 hour drive, our friend called to say he needed to go out of town the next day, so would be there at 5pm to install the part. So Bunny and the Blaz­ers ate a quick sup­per, then Climbed under the truck in the dark to help. With Hanna and Katie sit­ting in the sand under the truck hold­ing a flash­light, and the head­lights of 2 pick-up’s head­lights spot­light­ing the area, our 2 Aussie friends had the truck fixed in 90 min­utes. Ran like a dream with­out com­pli­ca­tions as we took food to over 300 orphans yes­ter­day (Fri­day) in Kwe Kwe. Made a stren­u­ous 15 hour day for us which had Bunny drag­ging a bit the next day, but it was worth it to have the truck in action again. AND THE FOOD GOES OUT! 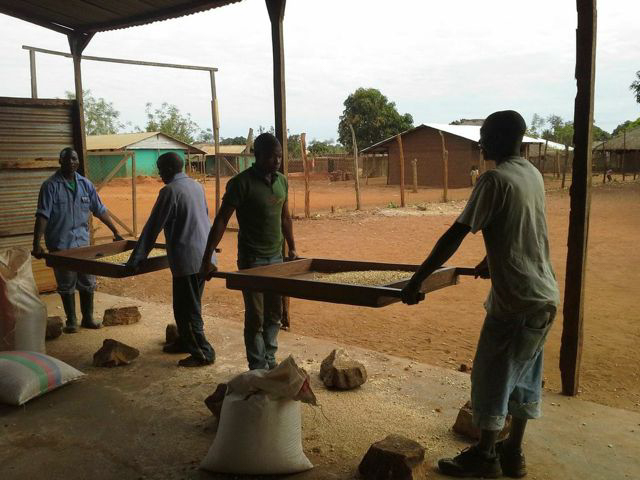 Over 650 orphans and wid­ows received over 12 TONS corn, beans, soap and salt this week as Capena, the 3 Balama Blaz­ers, and our men worked Thurs­day and Fri­day to deliver, return and reload to deliver the next day so that the kids would not go hungry. I stayed behind when the food teams went out, because Bunny and her brick lay­ers are build­ing a MIND BOGGLING MONKEY BAR SYSTEM at our Mis­sion station’s playground—a dou­ble decker jun­gle gym with mon­key bars, and hope­fully a 16 foot super slide com­bi­na­tion! The slide will begin from the top of the jun­gle gym at a height of 10 feet. Extra funds were given so that this mega jun­gle gym sup­ported by 9 con­crete pil­lars could become a real­ity for our chil­dren. The team is busy putting in the foun­da­tion for the 9 con­crete pil­lars today, so I’ll pho­to­graph it as the frame goes up over the next 2 weeks. It is one of the biggest con­struc­tion chal­lenges the team and I have ever attempted, as coor­di­na­tion with our car­pen­ters is needed for all the wooden beams that will sup­ply the “bars”. 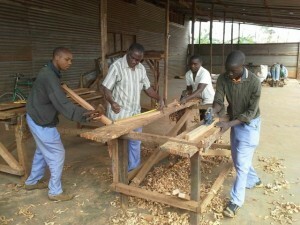 Metal pipe is sold out in Pemba due to all the heavy con­struc­tion, so we are forced to use wood instead. Will make it more of a chal­lenge to climb and to build! THE DESIGN is totally a “Bush Bunny dream design” inspired by watch­ing Swiss Fam­ily Robinson—always did want one of those tree houses! So even though ours is built from the ground, the 2nd story is IN THE TOP OF OUR HUGE MANGO TREE at the play­ground. With mango sea­son just 3 months away, I can see the kids throw­ing rocks from the 2nd story of the jun­gle gym to get the best man­gos out of that tree. Men using large “sift­ing trays” with screen bot­toms to clean the corn of loose debris before it is sent to the mill at the mis­sion sta­tion. We mill 1.2 TONS a week in our own mill to feed the 119 orphans who live with us ‚as well as the 150 orphans and wid­ows who fetch food each Thursday. OK, off to Mon­tepuez so I can find some inter­net so I can to send this. I truly enjoy your e-mails, and so far, sim­ple text e-mails are get­ting through. Please con­tinue to write, as it truly encour­ages all of us. On Thurs­day morn­ing, I was in Rovuma check­ing on 3 new baby goats, when Sal­vador, our 13 year old orphan from Nacala vil­lage 3 miles (5km) away, walked up to the goat pens accom­pa­nied by Pas­tor Salazar, his fos­ter Father. His badly infected and painful hand was so swollen that it resem­bled a rub­ber glove full of air. Straight to the hos­pi­tal we went, and PTL, the Doc­tor was able to attend to him imme­di­ately in the Emer­gency Room. Hav­ing to lance any wound is very painful, but hands are even worse due to its many nerve end­ings. I take my hat off to Sal­vador, as he han­dled the pain with min­i­mal squirm­ing and only a few tears, as 3 men held on to him so he wouldn’t strike the Doc­tor dur­ing the pro­ce­dure. Because I had to be in Pemba on Fri­day, I orga­nized Youth Pas­tor Car­l­i­tos Jorge to take him to the hos­pi­tal for the fol­low­ing 4 days for fur­ther treat­ment and Peni­cillin injec­tions. Motor­bikes play a big part in our min­istry, as they can get to places that our trucks can­not. Nacala vil­lage is one such place, as the road is very dif­fi­cult for even 4 wheel drive pick-ups. Used for both evan­ge­lism and res­cue, these bikes are a super valu­able instru­ment in sav­ing lives both spir­i­tu­ally and phys­i­cally. Your love gifts at work! The walls are up and the roof is in progress. The car­pen­try shop is busy mak­ing the door and 2 win­dows for the new house as well as a new door and a win­dow for the widow’s house. Presently they have no secu­rity for their belong­ings, as the house only has a “cana” door. That’s a door made from the stalks of sugar cane. Sturdy enough to keep out hon­est peo­ple and roam­ing goats or dogs, but is no chal­lenge if some­one really wants to get in. Capena, our Office/Orphan Admin­is­tra­tor, has been busy since last Thurs­day, check­ing on the 300+ orphans & wid­ows in the Kwe Kwe area (9 vil­lages in all). Each year he per­son­ally vis­its the homes of those on our list to check on their con­di­tion and to make sure they still need our help with food. Orphans who are now inde­pen­dent, and no longer need our help, or who have got­ten mar­ried (age 15 is mar­ry­ing age here), are deleted and young orphans on that village’s “need assis­tance list” are added in their place. It’s a BIG JOB, as you lit­er­ally spend days walk­ing from hut to hut with the vil­lage chiefs, mak­ing very tough deci­sions as you visit hun­dreds of mud huts. On Mon­day, Capena and I will final­ize the Kwe Kwe list as their first food dis­tri­b­u­tion is this Thurs­day and Fri­day. The 7 ton truck is tem­porar­ily out of action, as we need to have the air brake sys­tem repaired to pre­vent a road­side break­down if the “cylin­der” hap­pens to crack fur­ther with all the jar­ring this truck takes on these rough dirt roads. The part is being flown up this week, and should be in our hands by Tues­day. Once the part has cleared cus­toms, Eric plans to fly in to make this major repair. This makes the Kwe Kwe dis­tri­b­u­tion a bit more dif­fi­cult since we can only use 1 truck, but NOTHING IS IMPOSSIBLE WITH JESUS BY OUR SIDE! Mon­day after­noon, Manuel will take Nel­son, age 16, the orphan leader of our boy’s dorm, and 4 other teens, to the 2 day State Children’s Par­lia­ment being held in Pemba. School is out for the next 2 weeks, so teens from all over the state will be spend­ing this week help­ing law mak­ers by giv­ing tes­ti­mony on how new laws could help all chil­dren in this nation to grow up to be bet­ter cit­i­zens. It’s a great honor to be cho­sen as the 5 will rep­re­sent the 80,000+ chil­dren in our county (district). Katie flew back from South Africa yes­ter­day with a bag full of “good­ies” for all of us. She passed the first part of the res­i­dency process and received her Res­i­dency VISA at the Mozam­bi­can Embassy in Johan­nes­burg. On Tues­day, Capena will drive her back to Pemba to sub­mit the 7 required doc­u­ments to request a 1 year tem­po­rary res­i­dency card. This is essen­tial if she wants to help us for the next year, since vis­i­tors can only stay 90 days in this country. A busy week ahead will keep Bush Bunny and the Balama Blaz­ers hop­ping for sure! Keep us in your prayers. OUR GOATS LINE UP FOR WORMING TREATMENT. We love to show you our beau­ti­ful goats and the crew loves it too. HAPPY doesn’t come close to describ­ing how our team felt when we com­pleted the corn buy­ing on Wed.! Our ware­house is “full, full” as our Moz. work­ers put it (one of the few Eng­lish words they know). When you walk through the dou­ble doors of our corn ware­house, you are totally sur­rounded on 3 sides by 300+ TONS of corn stacked 13 sacks high, as they “pil­lars of corn” now touch the 12 foot rafters. The 72 men who made this pos­si­ble went home with a smile on their faces and cash in their pock­ets, as 50 of them don’t have reg­u­lar work. The corn chutes and all the pro­cess­ing equip­ment is packed away until next year. Thanks to many gen­er­ous donors, the 3 woman Balama Blazer team, and our 72 man crew, another suc­cess­ful food buy­ing sea­son is behind us. “DIAL A MECHANIC” SAVES THE DAY! On Tues­day, Manuel was to haul in corn, and then have his truck loaded with 4 tons of beans for the orphan ware­house in Meluco. 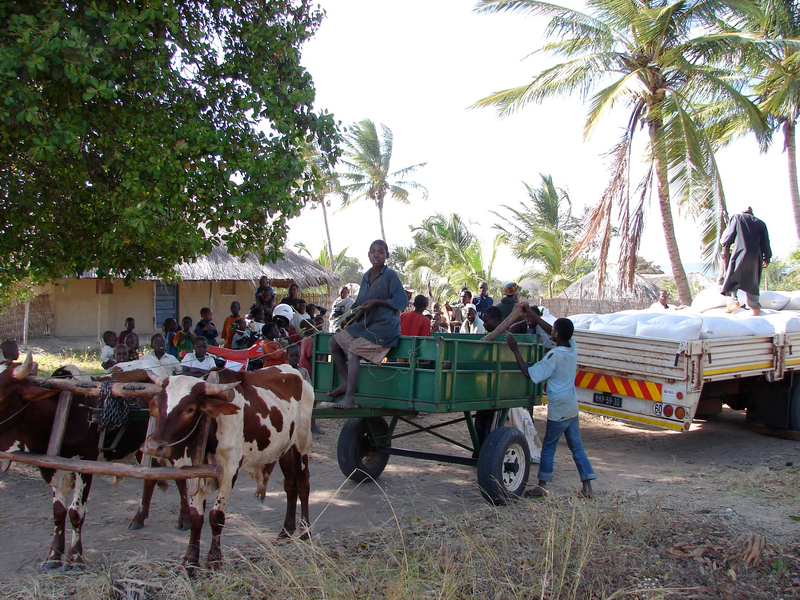 As he pulled into the Balama weigh­ing sta­tion with his load of corn, his face told me some­thing was wrong. He had lost air pres­sure in the front air brake tank (mean­ing brak­ing was VERY slug­gish). OH NO! The truck must have an air leak. My heart sank, as I knew the Meluco trip was in dire jeop­ardy. The men unloaded the 5 tons of corn as Manuel and I went over the air-lines with lis­ten­ing ears, look­ing for the leak. Found it! One of the air cylin­ders on the rear axle was hiss­ing air in a high pitched squeal from a pin hole around it’s con­nect­ing nip­ple. Whip­ping out my trusty cell phone, I had Eric Dry, our South African “DIAL A MECHANIC” part­ner on the phone in sec­onds. Eric con­firmed that the pin hole should be repairable, and told me where to find the “STEEL EPOXY” in our work shop. This stuff makes super glue look like silly putty, as it lit­er­ally becomes LIQUID STEEL when the con­tents of the 2 tubes are mixed together. (When mixed, you bet­ter hop fast, cause you have only 3 min­utes before it hard­ens!) If this didn’t stop the leak, then 50 orphans were going to go hun­gry in the game reserve as they eagerly wait­ing for our food drop on Thurs­day. Too much rain at the wrong time and hun­gry baboons had done a num­ber on the food they planted in their fields this year. The alter­na­tive was to take the truck into Pemba, 4 hours away, in hopes of find­ing the needed part and get­ting it replaced. (Could take days or even weeks if the part wasn’t avail­able!) The glue was mixed, the hole fixed, and after a 2 hour wait, the glue was dry. Manuel fired up the truck and the air pres­sure began to build. It was a sweet sound when the tank filled, and no HISS was heard from the repaired cylin­der. The truck was ready to be loaded for the food drop!!!! PTL!!!! Thanks to Eric and Manuel, the food was delivered. Manuel made the food drop with­out com­pli­ca­tions on Thurs­day, and a bunch of chil­dren waved good bye with big smiles on their faces. Those children’s needs are met now for the next 8 weeks. 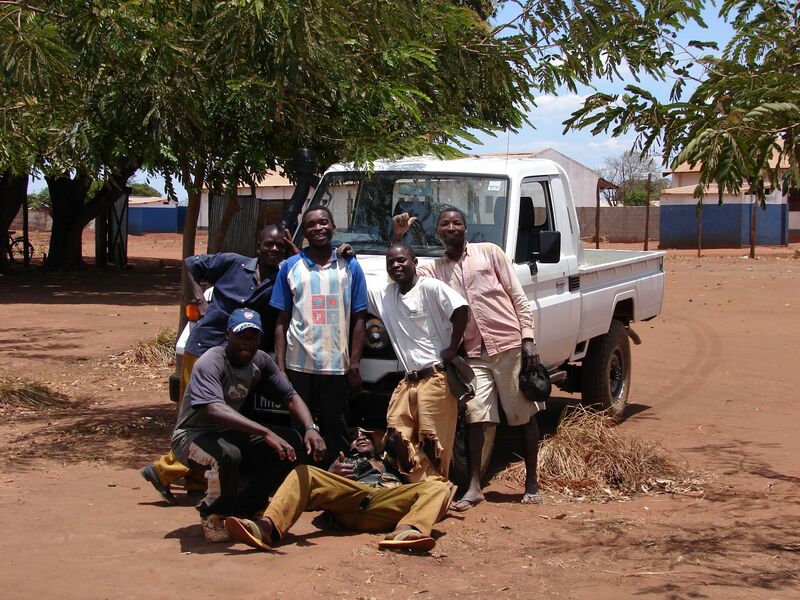 PRAISE THE LORD, AND THANK YOU ERIC, and our truck team for mak­ing this a suc­cess story instead of a heart break. 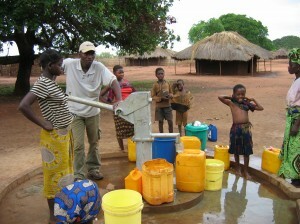 Clean water from the repaired water well brings smiles all around. Manuel, the only man who has been with me for the full 15 years I’ve been in Balama, is now our main mechanic and water well repair­man. Thanks to Eric’s train­ing, Manuel and his mechan­i­cal skills has now become the local hero to the 27 orphans and wid­ows we now sup­port in the vil­lage of Nacala. Early this a.m. I received a call from Pas­tor Salazar, who heads up the 4 fos­ter mother homes in Nacala which hosts 24 orphans (includ­ing the 7 chil­dren that were sur­viv­ing on their own before we gave them a help­ing hand). 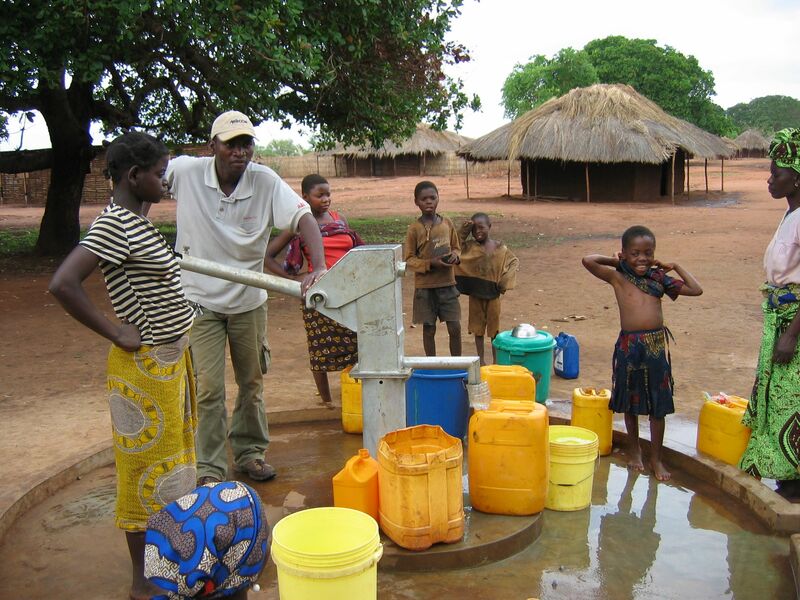 The vil­lage water well had bro­ken, and they des­per­ately needed it repaired as the local “hand dug wells” are all going dry. Cholera sea­son is just around the cor­ner, and dysen­tery is start­ing to attack many of those who get their water from hand dug wells. Sat­ur­day is Manuel’s day off, and he was try­ing to find parts to repair his motor­bike so he could attend the wed­ding of a local Pas­tor about 14 miles away. 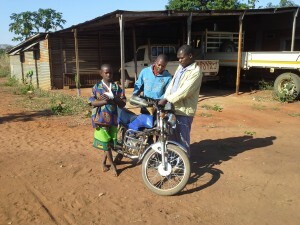 I offered to loan him our motor­bike, if he’d come fix the well instead. He gladly did so, and upon his return, he told me that the whole vil­lage turned out to watch his team repair that well. When the water started flow­ing, the vil­lagers broke out in loud cheers with danc­ing in cel­e­bra­tion of clean water! They wasted no time, as eager hands began pump­ing as fast as pos­si­ble to fill everyone’s con­tain­ers. 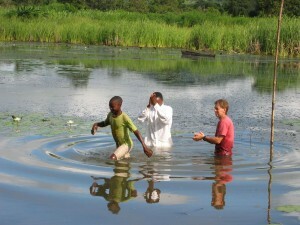 Such are the rewards of serv­ing the Lord, for He blesses those who put oth­ers first. 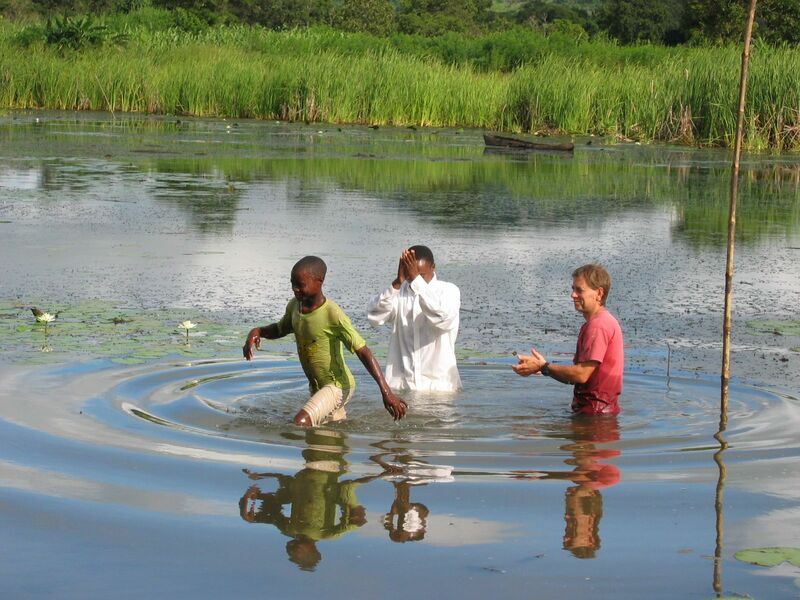 JESUS’ LIGHT NOW SHINING BRIGHT IN NAMUNO COUNTY I’ll tell you more as the story unfolds, but our 2 sis­ter churches in the county to the south of us, are hav­ing a revival! The 2 Pas­tors that guide these flocks are sup­ported by Hine­ston Taber­na­cle, in Hine­ston, LA. This week both Pas­tors ped­alled over 25 MILES through the bush to ask us for Bibles and teach­ing tracts, as those hun­gry for Jesus were eager to know more! Jesus said that in the last days, many peo­ple in “out of the way (rural) areas” would expe­ri­ence HIS LOVE and seek the truth about HIM. Looks to me like that “time” has begun. KATIE FLIES TO SOUTH AFRICA ON MONDAY… For she has com­mit­ted to stay a year to help the orphans and all that rais­ing chil­dren entails. The first step in get­ting a 1 year res­i­dency per­mit is to fly out of the coun­try to obtain a res­i­dency visa. Eric will host her and help her shop so she can return with a suit­case full of much needed items we can’t get here. She’ll be in RSA from Mon­day to Fri­day, so we warned her to not eat too much ice cream while down there! That’s the news from Bunny and the Blaz­ers this week, so know that we love and appre­ci­ate all of you for mak­ing it pos­si­ble for us to show Jesus’ love to these chil­dren in a very real way. LET THE FOOD DISTRIBUTIONS BEGIN!